Intended or otherwise, Shin’en Multimedia’s FAST Racing League has quietly become Nintendo’s unlikely marquee arcade racing franchise in the now generations-long glaring absence of the first party F-Zero and Wave Race. Stepping in exactly as needed with the Wii, it wasn’t until 2015’s FAST Racing Neo on the Wii U that Shin’en started getting some serious attention for their work. There are some sights that should always be part of the imagery associated with freshly-launched gaming hardware. Brisk winter settings, ludicrous high speeds, and big damn air among the most crucial. For the series’ third outing, FAST RMX, the franchise takes center stage as one of only a small handful of games to welcome Nintendo’s seventh game console, Switch, to the world. For the most part, it does well with the attention. As the name implies, FAST RMX is actually more of an upgrade package to FAST Racing Neo than a proper new title in the series, following the trend of former Wii U exclusives salvaging some measure of long-term viability with moves to other platforms with more promising futures. The most dizzying, nope-inducing heights of the Switch launch are not found in Hyrule. 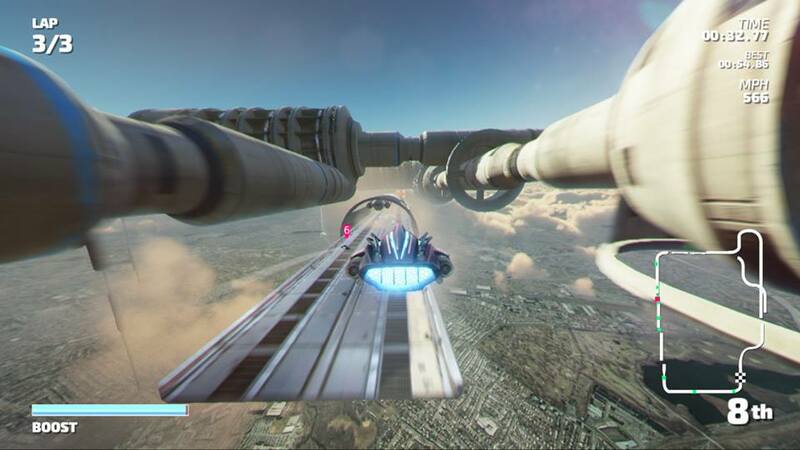 FAST’s entire identity falls into something of a perfect hybrid between established genre staples F-Zero and Wipeout, deriving its basic handling and weapons-free approach to gameplay from the former, and its trickier technical cornering, overall aesthetic, and manufacturer-based vehicle selection from the latter. Add to the mix the Ikaruga-inspired Phase system, which has you toggle your car between two different exhaust states to exploit certain sections of the track layout, and you have something altogether unique. 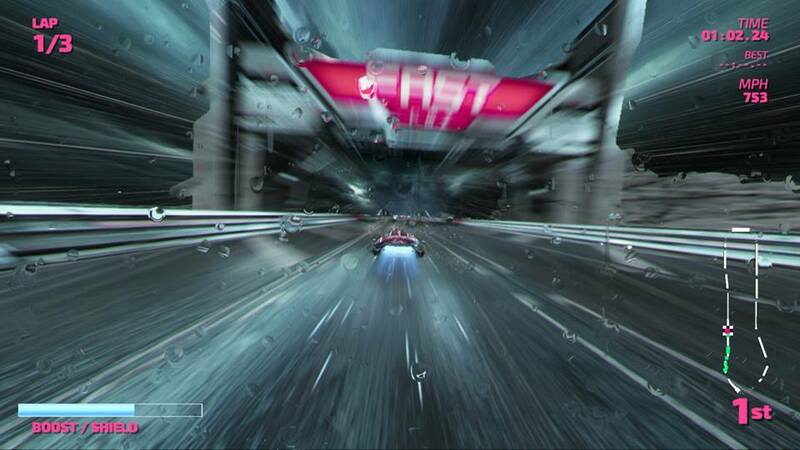 The core single-player campaign sees you pick one of the game’s car manufacturers and play through one of ten different three-course cups (giving the game a bursting-at-the-seams total of 30 courses in all) until you’ve gotten through all 10 throughout three speed classes – Subsonic, Supersonic, and Hypersonic. This in itself is a tremendous wealth of content that more than covers the $19.99 cost of admission. 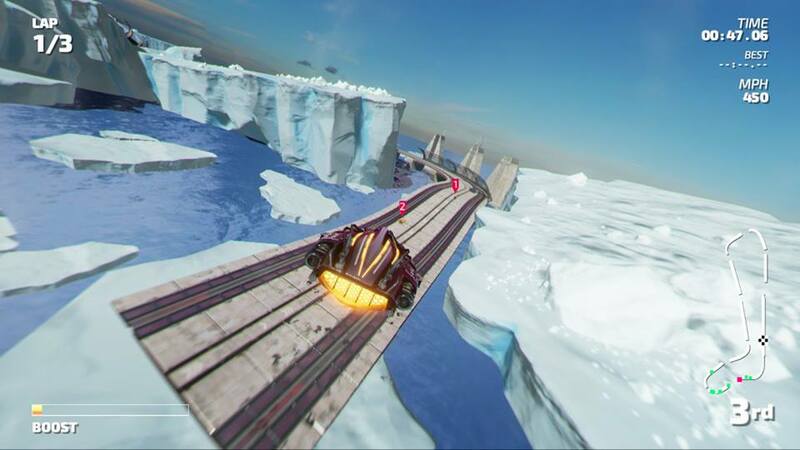 Since jumping into the futuristic racing genre with FAST Racing League, and by taking obvious cues from the masters, Shin’en Multimedia have developed a keen sense of how great futuristic racers are crafted. 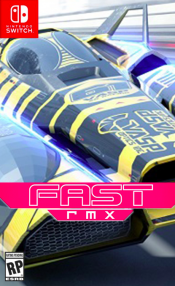 All of FAST RMX’s vehicles feel distinct in their handling, justifying each of their presence in the game when it would have been all too easy for them to have been the same four or five cars simply reskinned. 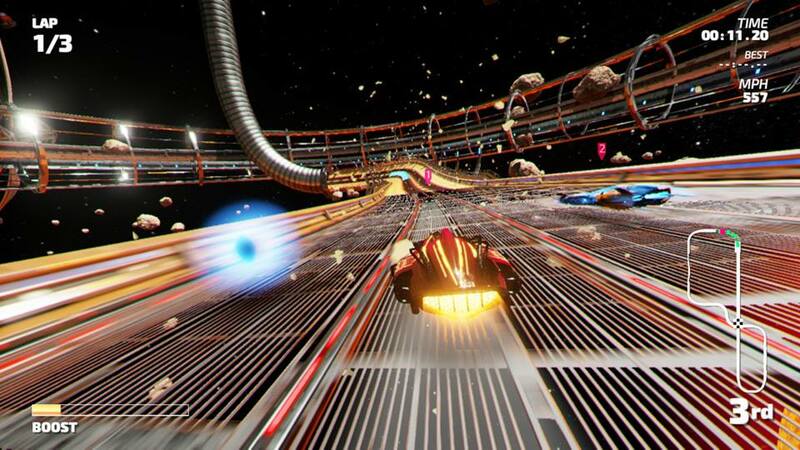 The circuits themselves are an even brighter spot, though not devoid of the occasional somewhat forgettable track, Shin’en’s knack for course design has never been more obvious than in FAST RMX. A little bit of dedication, and you’ll be flying around these courses like you’ve been playing them your entire gaming life. It’s unfortunate, then, that they still haven’t weened themselves off of a pair of poor design choices in this genre – cinematic collisions and ambient hazards – sometimes in combination with one another, which at times escalate to the level of cardinal sins in their severity. Courses like Iceland and Kamagori City might go down as some of the most memorable circuits the genre has ever produced if they weren’t littered with rubble meant to commit players to a precious-seconds-long crash animation and a full-stop reset. It’s challenging, but it’s not fun. That they are presented directly alongside the squeaky-clean (and brilliant!) Storm Coast to comprise the Argon Cup shines an even brighter spotlight on the issue. It’s not a dealbreaker, mind you, but it does undermine the fun-factor and overall quality of the game to a noticeable extent, which is a real shame. The biggest new addition to FAST RMX is Hero Mode, which is the series’ most obvious attempt yet to fill the void created by Nintendo’s apparent refusal to resume the F-Zero franchise. Unlike Championship Mode, Hero Mode is presented as a series of one-off races that start you off with a full boost meter that also serves as your vehicle’s shield gauge. Boost at your own risk, because once the meter drains, any contact will cause you to crash out of the race entirely. Automatic crashes that disregard the shield gauge (see the above paragraph) are also instant-fail states in Hero Mode. Thus, not every one of FAST RMX’s cars is well-suited for this challenge, and it clearly isn’t the main attraction of the game, but it’s still a fun experiment worth looking into, especially if you have an F-Zero fix you need to satisfy. Hero Mode is many things. Dull is not one of those things. Not originally slated for the Nintendo Switch launch, Shin’en Multimedia took a huge risk in pulling back the release date for FAST RMX to arrive alongside the system, serving as the only racing game on the menu for the system on day one. The added attention should do wonders for an up-and-coming racing franchise that truly deserves it, it’s only a shame that Shin’en couldn’t have kicked a couple of bad habits that prevented FAST RMX from taking full advantage of the launch lineup position and instant classic status. If they could have accomplished that, we might not be talking about whether they filled the void left by F-Zero, but whether or not they had genuinely carved out their own position right alongside it. Don’t mistake the Switch’s mobile-based architecture for weakness. It can certainly still impress. 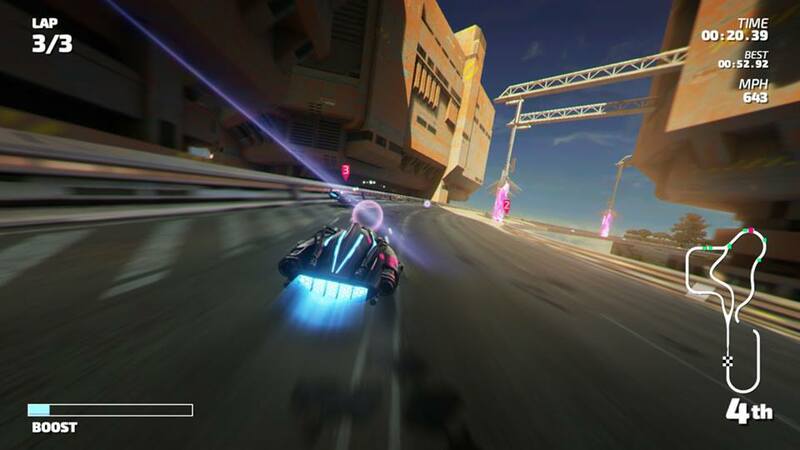 Still, if you have a love of racing games and want something to play on your new Nintendo Switch that isn’t The Legend of Zelda: Breath of the Wild, it’s really hard to go wrong with FAST RMX, especially at the bargain basement price of $19.99.